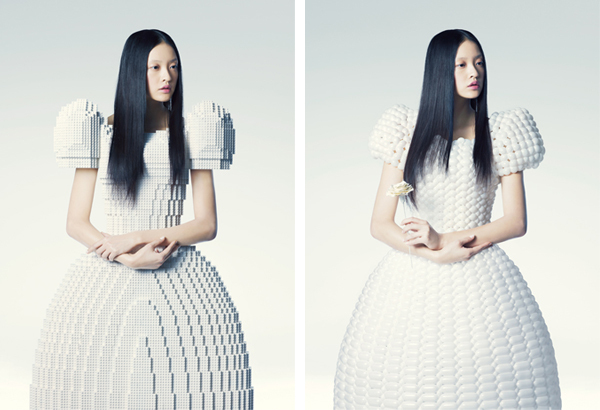 Rie Hosokai’s LEGO dress and the balloon dress it was modeled after. Designer Rie Hosokai of Daisy Balloon has created a white dress made entirely out of LEGO bricks for the Piece of Peace world heritage exhibit. The design of the LEGO dress is based on one of Hosokai’s balloon dresses. Self-consciousness was once whole, but in the modern trend where all things whole get broken down,it too is about to get deconstructed. This knowledge that bonds different people together seems to appear suddenly,but in reality it is already coded into our planet, our universe. To find the answer, we must continue to turn our gaze toward those around us.